Raymond Turkas Jr. is the owner of Strip District Meats and also the senior butcher of the cutting room. Ray began working at the store over 47 years ago when the store, owned by his parents, focused on poultry and was originally located in McKees Rocks. It was Raymond, who expanded the store to sell pork and beef many years ago, as it moved to its current location in the Strip District. 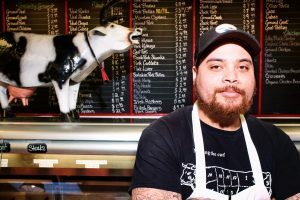 Raymond attended Carnegie Mellon University as an art major after high school, his love of art and his passion for creativity are evident in his work with meat today. Over the past few years, Ray has really expanded the exotic meats sold at Strip District Meats. Many people are interested in trying and preparing new types of animal protein, and Ray recognizes that interest. You can find anything from rattlesnake meat to ostrich in stock at Strip District Meats. As a local resident, Ray Jr. enjoys dining at the many new restaurants in the city of Pittsburgh. When Ray isn’t at work, he enjoys relaxing on lake Edinboro. Raymond Turkas III is the son of our senior butcher, Raymond Turkas Jr.. Ray has been involved in the family business since he was born, whether it be working counter while in high school, cleaning the store, or working hard in the cutting room as an adult. He has been here throughout life. Following in his father’s footsteps, Ray can carve just about any piece of meat. Ray has quite an artistic touch, attention to detail, and an understanding for what each customer wants; all attribute to his talent with a knife. No matter how busy Ray Ray may be in the cutting room, he always has time to spend with our customers. Whether he is simply giving suggestions, answering questions, or sharing stories; he is the person customers’ enjoy speaking to. Ray resides in the Strip District, where he enjoys walking, shopping, and dining. 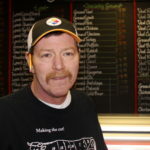 Michael Wilson has been working at Strip District Meats for the past 22 years. He joined the staff many years ago, and quickly familiarized himself with the cutting room. Mike is responsible for overseeing all smoked products and our on-site smokehouse. He knows just how long to smoke our famous holiday kielbasa, as well as many other delicious types of meat. Over the years, Mike has developed a talent in carving, cutting, portioning, and trimming all meats. From fulfilling holiday orders, to cutting just the right steaks for your summer cookout, Mike’s talents are evident in all his work. Mike’s knowledge of each type of animal protein is evident in the confident manner he carves each order. His products are exactly what you are looking for. Mike enjoys both cooking and spending time with his three children when he is not working. Bradley Bengele is the son-in-law of Raymond Turkas Jr. Brad joined the cutting room staff just four years ago, shortly after his daughter was born. Since then he has been working hard learning the trade, ordering product, and successfully managing inventory within the store. 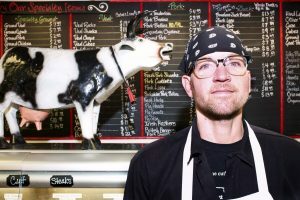 Prior to working at Strip District Meats, Brad worked as a Physical Education teacher in an elementary school for 6 years. Switching careers was a big decision for Brad, but one that he made by jumping right in. Brad spent his life in sports, both playing and coaching. These experiences have molded Brad into the leader he is today. When Brad is not at work, he can be found hunting or snowboarding. He enjoys spending time with his wife, Christie, children, Madden and Cole, and Sasha, his dog. 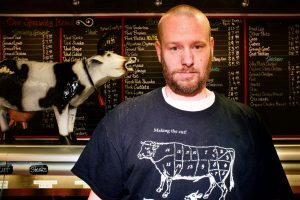 Bill Duttine has been working at Strip District Meats for about 6 and a half years. Bill was born and raised in Pittsburgh, but moved to Lansing, Michigan to be with family for several years. 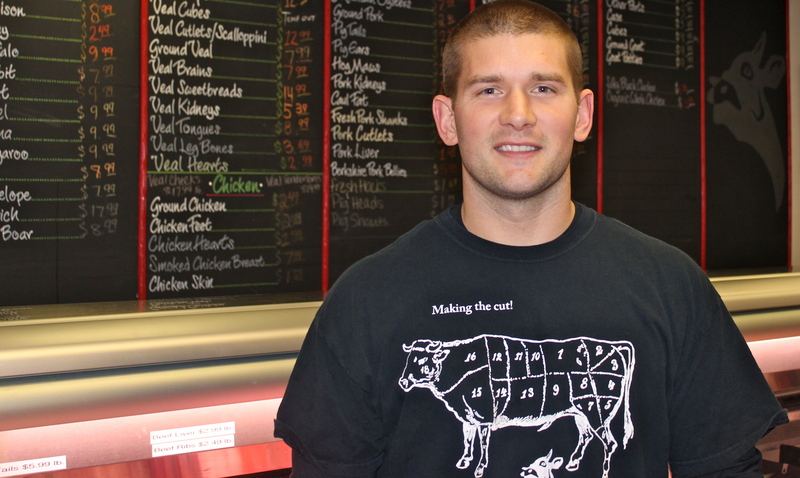 Upon returning to the city he loves, he began his journey here at Strip District Meats. Bill quickly became the man of many different hats. On any given day, you can find Bill completing inventory and ordering product, cutting pork for the case, filling specialty orders, or assisting customers with our expansive exotic and specialty case. Bill enjoys talking with customers interested in some of the more rare and exotic items found in our store. If a customer is looking for a lean meat, Bill can recommend the best proteins and assist them in locating the best fit for their interest and need. Bill is friendly and sociable, and always ready to help those in need. In his free time, Bill enjoys spending time with his family, fiance Morgan, and their children. He also enjoys both sports and music. 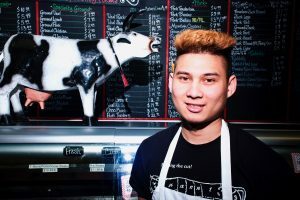 At 22 years old, Saw Setakaw is the youngest butcher at Strip District Meats. Don’t let his age fool you, he knows how to use his knife. Saw joined the staff of Strip District Meats in September 2015 as a delivery driver for the business. While he continues to drive on occasion, his time is very invested in our cutting room. Over the past few years, Saw has learned how to trim, cut, and portion all the meats sold in our store. Saw’s primary responsibility is setting up and preparing the cuts found in our beef case. He cuts anything from steaks to roasts, trims beef tenderloins to hanger steaks, and even skewers kabobs. Once his case is set, Saw enjoys filling wholesale orders and trimming products. Saw loves to talk with the customers; and is always ready to answer any questions. Saw is a humble guy, not one to toot his own horn, but we sure are glad to have him here as a member of our staff. He is family oriented; and loves to cook. Saw also enjoys fishing. In Pittsburgh, he finds the rivers, lakes, streams, and creeks provide plenty of options for a good old afternoon of catch and release. 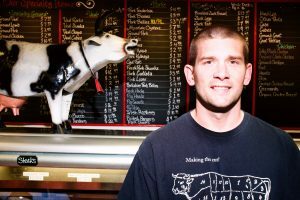 Eric Ingram joined the staff of Strip District Meats in August of 2016. He began working with us as a sales clerk in the front of the store. He was fabulous! He worked well with the customers; and was very accommodating to their needs. While we were sad to lose him in the front of our store, he was needed in the back. Eric refers to himself as an art fanatic, earning his Associates Degree in Graphic Design from the Art Institute. His talent and passion for art made him a great candidate for the cutting room staff. After a year and a half in the cutting room, Eric is responsible for setting up and cutting all the meats in the Pork case. Like all our cutting room staff, he pitches in and helps with whatever is needed. He believes you should always give 100%, come in ready for the day, and have a positive attitude all the time. Eric is a positive role model for his children and hopes to teach them hard work pays off. In his spare time, Eric continues to develop and enhance his creativity through various arts, such as: tattooing, typography, photo realism, and surrealism.